I am SO happy that the sun has started making a regular appearance lately. Okay, so the weather was pretty weird today - it started off gorgeous and warm and sunny, and then this afternoon turned bleak and cold, foggy and dull - completely bizarre. 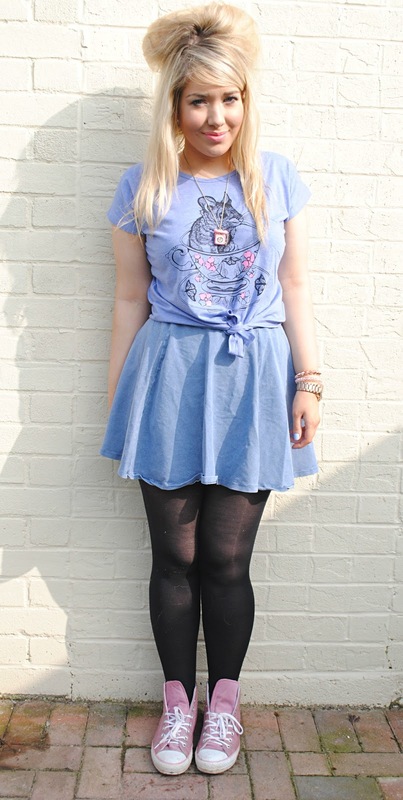 Anyway, this morning I embraced the sunshine and took some outfit pics featuring my gooooorgeous new t shirt from Brat & Suzie. I've always admired this brand from afar, so when they offered to send me something I couldn't resist. I had to have this cute mouse-in-a-teacup top. 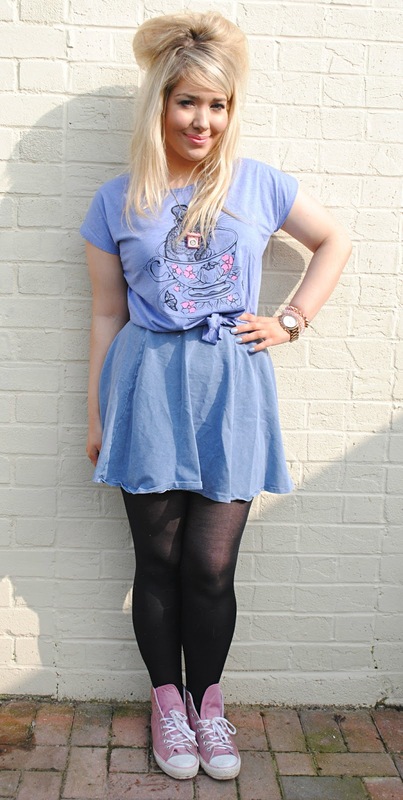 I mean, for one lilac is one of my favourite colours to wear, and the print on this is just simply adorable. I love the fact it's a tie-front top too - perfect for pairing with high-waisted things. I can see me wearing this so much over the summer! I decided to pair it with my bargainous denim/cotton skirt from New Look - I'd seen one similar on the Topshop website, swooned over it, and then spotted this extremely similar version in New Look for half the price. Although it looks pretty much the same colour as my top in these pics, it's actually a pale denim (not lilac!) Even though it has an elasticated waist, it runs pretty small so I'd probably size up. I know this will go with so many things, especially over the summer, so I definitely see it as an investment piece - even though it was only around £12! Hope everyone is having a good week! It'll soon be the weekend!